Some summerhouses on the market are made by shed manufacturers, fair enough, but when you are looking for a higher level of finesse, Alton summerhouses really stand out from the crowd. 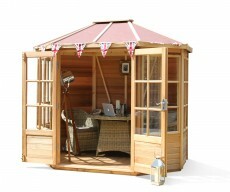 Your new Alton Summerhouse will be a little haven in your garden. A tranquil corner where you can relax, read a book, do the crossword, do your craft, or even do your office work. What can be better than sitting amongst the birdsong with the sun streaming through the windows, away from the phone, the doorbell, the household jobs...? Why put off a BBQ because it might rain a little? With your new Alton summerhouse, you can always have a dry table and chairs and place to eat without losing the BBQ atmosphere by retreating into the house. A = Base width: 2,482mm (8ft1). C = Eaves height: 1,949mm (6ft4). D = Ridge height: 2,492mm (8ft2). 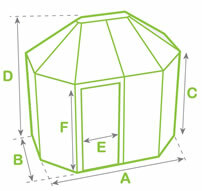 E = Door width: 1,227mm (4ft). F = Door height: 1,793mm (5ft10).